Samsung has introduced another tablet into the phone world. 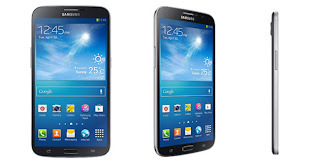 The new Galaxy Mega is available in 6.3- and 5.8-inch versions. Samsung said the Android device offers a mix of popular smartphone and tablet features, including a split screen and multitasking between video and other apps. The Android 4.2 devices come with dual-core processors, 8/16GB internal storage expandable up to 64GB with a microSD card, 1.5GB RAM, 8 megapixel rear camera and 1.9 megapixel front camera, and Wi-Fi access. The 6.3-inch version boasts a bigger battery and faster processor and will offer LTE support, while the 5.8-inch Galaxy Mega will support HSPA up to 21Mbps. The Group Play function on both devices allows up to eight users to share the same content on the device over a Wi-Fi network. To facilitate video, Samsung Link allows content to be streamed to a TV, computer or tablet, and the Samsung Watch ON feature transforms the device into an IR remote control for a TV or home entertainment system. It will be available from May, initially in Europe and Russia, and gradually spread to other markets around the world. In the Netherlands, Samsung said the 6.3-inch version will be available in June for a recommended price of N121, 000.00 including VAT.